A common misconceptions that plagues beginner pixel artists is the notion that size = realism. That is, that a small sprite doesn't give them enough space to create a character with realistic proportions. However, it all comes down to economy of space. Obviously, the sprites on the right are the least realistic. However, the answer to making them more realistic isn't to just make them larger, but to use the space differently. 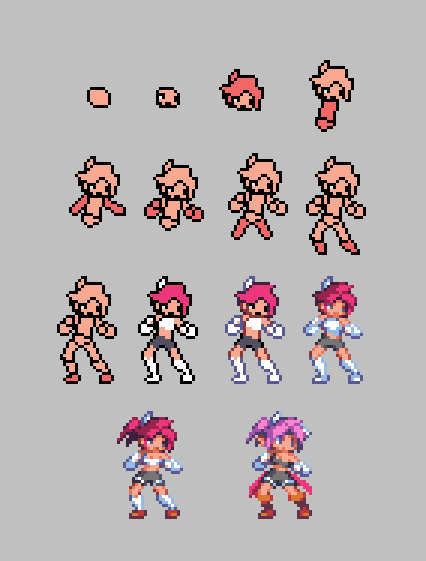 The sprite on the far left cuts down on the size of the head as much as possible without sacrificing the ability to be expressive, freeing up the rest of the space for more realistic proportions and more dynamic poses. Economy of space, in my opinion, ends up being the longest learning process for an artist. When creating the player's first idle pose, I often spend hours tweaking a simple standing pose until I finally feel as though I've stumbled upon the best balance between resolution and detail. The face tends to be the biggest factor. Never be afraid to spend too much time on the initial pose or facial features. The more time you spend on it, the easier it will be to create poses and expressions that you're satisfied with. Nothing is worse than feeling limited by your own work. I can't tell you how many times I've looked at a sprite's earlier state half an hour later and thought "Damn I'm glad I didn't settle for that"
I'm so bad when it comes to utilizing space. I almost always make stuff too big. These tuts are all nice though, Thanks and Happy New Years! I hope you have a happy new year Kyrieru, and of course to all the fellow followers of your amazing work! happy new year dood, lol the one on the left looks like she belongs in the game "disgaea" i'm just asking but is she going to be used in a game of yours? I really appreciate these little tutorials and technique blurbs. I hope you'll do one on animation soon. Always wondered what is the best tool to use to create and preview sprite animations. I use game maker's built in image editor. You guys are so glad to each other always(so gay),but in Soviet Russia we,bears on bysicles,are very serious to promises....So....Kyrieru.....Didnt u said your short game will be done in the end of the month?I am big fan of your works but I am do not like when promises like this dont at least commented by developers.When will u take my munny mate? Yes, it's important to keep promises. That's why I never make them. The notion of being finished by the new year was pretty much blown out of the water by stuff happening around Christmas. Can you give some quick tips on soundtrack? happy new year, kyrieru. keep up the good work. A bit late, but happy new year!